I do apologize for my absence, but I have a good excuse. I’ve finished the manuscript for my cookbook! We hope to have the book available for pre-order November 1st, and to start shipping December 1st. Hooray! This also means I’ll be able to focus on the blog again. To celebrate all this wonderful news, I thought I’d share a recipe that will be in the book. Who doesn’t like blueberry waffles? These waffles are great, but I especially like making waffles because they freeze so well. Having a waffle just out of the iron is a wonderful experience, but for me, it’s equally as wonderful to be able to go from sleepy pillow-creased face to homemade waffle breakfast in less than five minutes, just by popping some frozen waffles in the toaster. When I created this recipe I was out of maple syrup, so I concocted a lemon icing to go with the waffles. It’s a super tasty way to enjoy them, but you can never go wrong with maple syrup in my opinion. Edited to add: These work as pancakes, too! Thanks for reminding me, Esme! *If using frozen blueberries, keep them in the freezer until the last second. Reserve 1-2 Tbs of your dry mixture. When you’re ready to add the blueberries, take them out of the freezer, measure them and mix them with the reserved dry mixture. Then fold them into your mixed batter in NO MORE than three (3!!) folds. This will prevent your batter from turning a gray-purple color. Mix all the dry ingredients together well with a whisk. In another bowl, whisk the wet ingredients together. Combine wet and dry, then gently fold in berries. Spray your waffle iron with a little bit of oil and make a test waffle. In my waffle maker, 1/2 cup of batter is perfect for a single waffle, and they cook for 10 minutes. Follow the instructions or your preferred directions for your waffle maker. This recipe makes 10 waffles if each waffle uses 1/2 cup of batter. Mix in a blender until smooth. You can do it without a blender if you feel like sifting your powdered sugar to make sure there are no lumps. Nice to see you blogging again… the bloggy world was a little less exciting without you. Congrats on your book!!! I definitely look forward to checking it out. Congratulations! I am looking forward to the book very much. I saw all the great testing recipe photos on flickr and think you did an absolutely great job.Thanks for sharing the recipe. So glad you are back and can’t wait for the book! uh. hum. I know what I’m having for brunch this weekend. Thanks! Glad you’re back. I’ve missed your beautiful pictures. Congratulations on finishing your book. I can’t wait to order! Welcome back!! So excited about your upcoming cookbook. I’ll mark the pre-order date on my calendar! The timing is perfect for your post about waffles, I just got my first waffle iron and I’m so psyched to try it out!! Yay!! Not only are you back, but now I can ask for your cookbook for Channukah! (Not to mention give it to not a few people.) I can’t wait! Glad to see you back posting Lolo! I have an idea how crazy busy the testing and cookbook writing must have been. Even as a tester I was feeling pressured to try more recipes and help out. I’m definitely getting a few copies of your book when it comes out. Hope you guys are doing well. It was good to see you at Esme’s party. Party all the way up to argentina! Welcome back, and congrats on the book! Your test pictures were gorgeous and I’m sure the book will not disappoint. Can’t wait! don’t forget, these work as pancakes, too! Oh my goodness. Those look so fantastic. I really love the combination of blueberry and lemon… mmmmm. Yay! You’re back! Omg those waffles are breathtaking. Blueberry and lemon…mmmmm. Glad you’re back! Nice to have you back in the blogging world again Lolo. Even though I was testing I still missed your updates on here! I didn’t remember about the cookbook and I thought you had been sweltering in the Boston heat (my daughter lives there with no AC, too). If you think I haven’t noted November 1 in my calendar for pre-order of the book, you’re sorely mistaken. Welcome back sweetie! Wow now I want a waffle maker for this recipe, those waffles look fabu and I love the blueberry and lemon combination. What kind of waffle maker do you have? I am looking forward to your cookbook, I am definitely going to buy it!!!! Waffles look splendid! You have some great vegan recipes here! Oh WOW these look yummy! I just stumbled across your blog and I’m so happy to have found you!! I look forward to seeing your cook book. mmm these look so good. 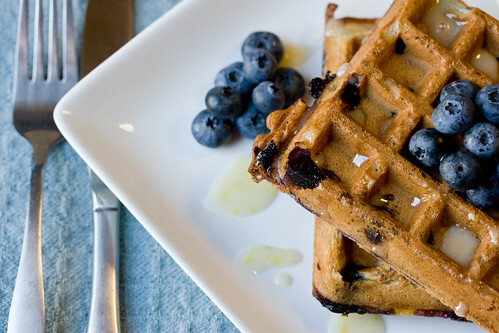 you can never go wrong with blueberry waffles. Just stumbled upon your blog and omg your recipes and pictures are divine. Had to just try the waffles, mmmm just marvelous. Like everyone else here I will be looking out for your book. Looks and sounds delicious! :) Great photos! These do look delicious – and I’m SO glad to hear that some of your comment-ers think they work as pancakes, since my little studio apartment kitchen hasn’t yet afforded room for a waffle iron. The idea of icing might have put me off at first, but it seems from the pics that it’s more of a glaze, which sounds as bright and sunny for a nice Saturday morning. Can’t wait to see the book, and best of luck! Ohh! It is like when I was in the US the last summer! 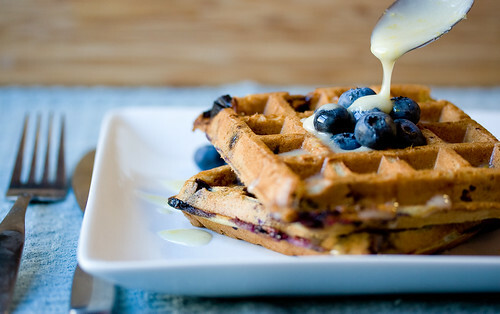 Waffle with fresh blueberries, a dream! THANK YOU! Being mildly lactose intolerant has been a BANE in my foodie life…esp with deserts:( my idea of soy was towards white tasteless cardboard, but since i saw your blog…its been WONDERFUL! Any idea if your cookbook will be shipped to ASIA? Please let me know/ Update when your cookbook starts shipping? I would LOVE to buy copies for my friends and i for Xmas! Congrats on all your creations..they are simply fantastic. I was just looking for a simple lemon glaze icing recipe, I wanted to ice a plain yellow or lemon cake, maybe layered so the icing will soak in for a more moist cake. I thought layering might make it drip in more thoroughly for moistness, or also while hot. And of course added blueberries we love which would also be healthier. (You know the anti-oxidant craze!) I was also interesed in adding more grain or bran to my blueberry muffins. I am looking for more healthy recipes and less carbs as my husband has recently been diagnosed with diabetes. I don’t want to skimp on the taste either! Thanks alot! Oh, what about heated jello for more moistness and a chilled or refridgerated cake seems to have a more refreshing taste. I often freeze and de-thaw cakes for more moistness. with the blueberry waffles, what is an iron? and do you particularly need a waffle maker to make waffleS? I have made many dishes from this site…but my favorite is the Blurberry Waffles recipe! These waffles were awesome, every bit as tasty as they look! I made them for my husband and I for brunch today and they came out fabulous, but we did have one problem… we ran out of the icing too quickly, and had a bunch of batter leftover at the end! My wafflemaker does Belgian style waffles, and we had enough batter to make at least 6 large Belgian waffles, which was too much for the two of us. This would be a great recipe for three to four people if you halved the mix and made the icing as a single batch, and a great recipe for five or six if you doubled the icing and kept the mix a single batch. Definitely invite some of your friends over for Sunday brunch for this one! I stumbled upon this recipe quite by accident on an app on my iPod, and I absolutely love them! The lemon icing is AMAZING and if I could eat it every day without getting fat I would! Thank you! I came across this website a few days ago and fell in love with the easy recipes (not any hard to find ingredients). I attempted this waffles recipe last night substituting the blueberry yogurt with strawberries & apple sauce. IT WAS AWESOME. My very strict vegan boyfriensd enjoyed them this morning for breakfast. Thumbs UP! ????????? ???? ???????? :) ?????????-? ???? ???????? ? ????????? ?????. January 29, 2010 - 9:42 pm ???? January 29, 2010 - 10:11 pm ??? Oh Plz Do ship your cookbooks worldwide. and i'll just keep checking your latest!